Yesterday was the International Day of Disabled Persons, and rather than celebrating the lives of disabled people, the news in Northern Ireland was focused on the changes to disability benefits known as Welfare Reform. The Northern Ireland Human Rights Commission and the Equality Commission for Northern Ireland released a joint statement on the “real hardship” the changes to the benefits systems are imposing on disabled people. The statement said the reforms were contributing to higher levels of poverty among the disabled and both groups called for more mitigation measures to prevent “further harm”. Whilst this statement is welcoming, and more people need to be aware of the abhorrent actions from the government towards disabled people, I feel it is necessary to add some level of personalisation to the rhetoric surrounding welfare reform. A few years ago, the government brought in a reform programme that included replacing Disability Living Allowance (DLA) with the Personal Independence Payment (PIP). Since last summer, disabled people started having to complete 50+ page application to PIP through answering extremely personal and upsetting questions on the limitations they face daily due to their disabilities. The major change from DLA is that your PIP allowance is determined by how many points you score. Yes, really, your struggles with your disabilities are now scored by the government, something that feels completely dehumanising and totally trivialises the pain you face daily. Following on from completing this utterly draining form, you are contacted by the private firm Capita, where they want to send a ‘Disability Expert’ out to your house to assess you and your disabilities. I must emphasise that the title ‘Disability Expert’ is not a protected title, and those who do the assessments often do not know anything about the disabilities you may have yet they get to decide “how disabled you are” and how many points you get. The mental stress and embarrassment of these assessments can leave many disabled people worse off for months, if not years. In addition, Capita have been facing many calls to be stripped of PIP contracts due to their conduct, with a Channel 4 documentary showing cases of assessors completing reports without even meeting the disabled person in question and admitting to completely dismissing what they are told by PIP claimants. Furthermore, there were many unethical problems with this firm and their conduct, as assessments were being rushed through due to financial incentives given to assessors, where they received £80 for the first eight assessments completed in a week and £160 for each assessment after that. Surely adequate time and sensitivity should be given to each claimant, rather than rushing through cases that can lead to devastating, life-changing outcomes for the disabled person in question. To make matters worse, the situation for disabled people in NI is particularly dire, as 36% of DLA claimants in Northern Ireland had their benefits taken off them compared to 27% in Great Britain. The government hasn’t suggested in any way whatsoever how they plan to mitigate the impact this will have on disabled people and their families, and levels of poverty in Northern Ireland continue to grow further. I am particularly angry about this situation as I had to go through this process myself from August 2016 – March 2017. This was the worst time of my life and the stress that was induced as a result made all of my conditions worse. I suffer from an auto-immune disease called psoriatic arthritis and have had this since I was 11 years old. My immune system attacks my bones, muscles and tendons and thinks that they are a disease. This started off in my knees and over time, has spread to every joint in my body and I am in immense pain daily. In addition, I have hypermobile joint syndrome, which can be easily described as being double-jointed, but when you have psoriatic arthritis, this means that even more of my joints are vulnerable and I frequently suffer from dislocated shoulders, as my tendons have been eroded to the point that they aren’t strong enough to keep the joint in place when it extends too far. I also have fibromyalgia, a condition that causes wide-spread muscular and bone pain, extreme fatigue, digestive problems and sensory issues with light and sound. As with many people, when you have physical disabilities, they can lead to mental health issues and I have suffered on and off with depression and anxiety for many years. My mental health was at the worst it has ever been when I was going to the process of applying to PIP, as I felt so uncertain about my future every day and how a stranger what didn’t understand my conditions got to control my future independence. When I finally submitted my PIP forms and scheduled my assessment, it was set for the day after I was discharged from hospital following getting steroid injections into both my shoulder joints. After steroid injections, you are supposed to be on bed rest for three days. The anxiety in the lead up to my procedures on my shoulders and my assessment the following day was unbearable, as I’d heard so many terrible stories about assessors lying about claimants’ disabilities. My assessor seemed very nice when she was at my house and didn’t expect me to go through the physical tests and I had slings on both my arms, yet she still determined that my disabilities didn’t impact my life enough as I opened a book (yes – seriously), drove a manual car, and was completing a masters, therefore she believed I didn’t require support. I was honestly dumbfounded at this reasoning and wasn’t awarded enough points to keep my motability car and support that enabled me to attend university in the first place. I went into a state of shock when this happened. I was so angry at the benefits system and had to work out how I was going to get out of my house every day without my car. 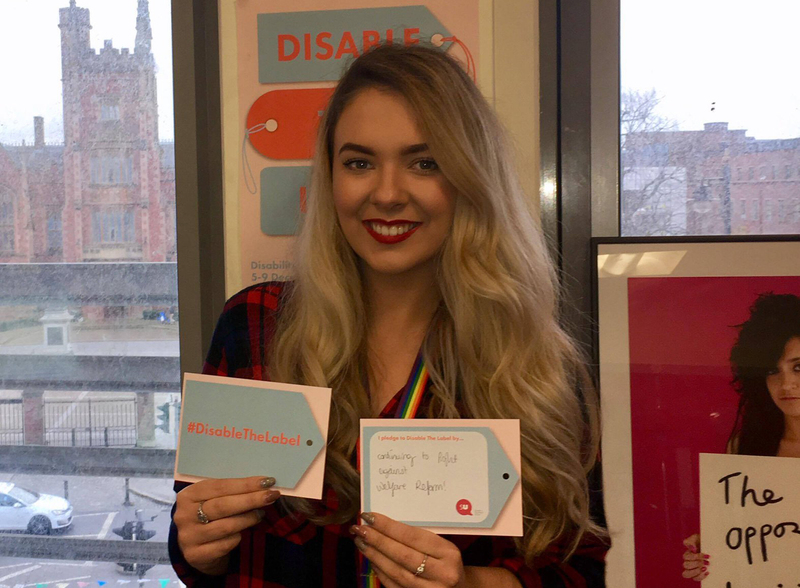 I decided to run to be Queen’s Students’ Union’s Equality & Diversity Student Officer to try to get as far away from this hideous benefits system and to help other students who are like me. I tried walking to work, but the tendons in my ankles and feet are so weak and damaged that I got tendinitis in both ankles and was in excruciating pain daily. I’m now in a position that I get a taxi to work every day, try to get on with my campaigns through the pain and exhaustion and make as many people aware as possible of the horrible treatment of disabled people by the government. My situation isn’t as bad as many others, who have ended up homeless as a result of welfare reform, and I am lucky that I have a voice to tell others of these laws and to campaign against them. However, many other disabled people aren’t in a position like mine, and it is time that we all come together and scream from the rooftops until everyone is aware of what the government’s austerity agenda is doing to disabled people. Welfare reform is making the lives of disabled people much worse, but we can come together and try to Disable the Label for them, as our welfare system us failing them. By Rachel Powell, Student Officer Equality & Diversity.